Welcoming our guests to enjoy a tasting menu experience that embraces everything that the seasons have to offer. Contemporary Canadian with some aesthetics and technique that are Asian-influenced. An open-kitchen concept that is personal and interactive, a unique and humble dining experience that is located in serene North Toronto. The tasting menu was interesting but not exceptional. The service was great and our servers were very knowledgeable about the different courses. The spring menu was devine! Both the alcoholic and non alcohol pairings complimented the courses perfectly! I can’t wait to see what the summer menu is! I only like 1 dish out from 10 dishes. They are mostly bland taste and definitely not worth $. Really enjoyed the pacing of the dishes which gives ample time for conversation. Service was top-notch and never rushed. I have already recommended this to all my family and friends. I would highly recommend this to all gourmet foodies as well. We came here for our anniversary. We got the tasting menu with wine pairings. Half was wine and half was sake. The food was simply incredible with beautiful plating. The ambiance was classy and mature, great for conversation. The service was the absolute best part. I am so impressed by the team working there. Such sweet people who are truly looking to provide a great experience. We chatted with each of our wait staff and felt like they were old friends. I plan on going here many many more times before they get more popular and I can't make reservations anymore. Incredible price as well. I am sure they can charge much much more for the fabulous experience. Please note, the menu changes twice a season, so this is a great place to go to repeatedly. A great restaurant with great service. Will be back soon. My wife and I dine out frequently and have been to every top restaurant in Toronto and to many of the world’s top 50. We feel qualified to say that Frilu is the best high end restaurant value! 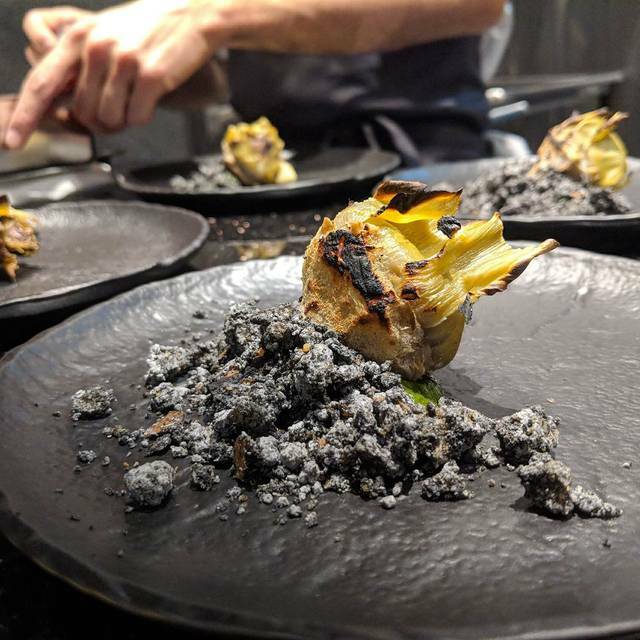 The food is creative and exceptional...the non-alcoholic tasting menu is wonderful....people are passionate and professional and we love every time we are Frilu. Three things to remember when you walk into Frilu...1. The professionals are in charge (this is a set menu and you have no say). 2. The pace will be determined by how you choose to eat your food but plan on a 2-2.5 hour experience. 3. The price is set ($95++) so the bill should never a surprise and as such you can enjoy the evening. 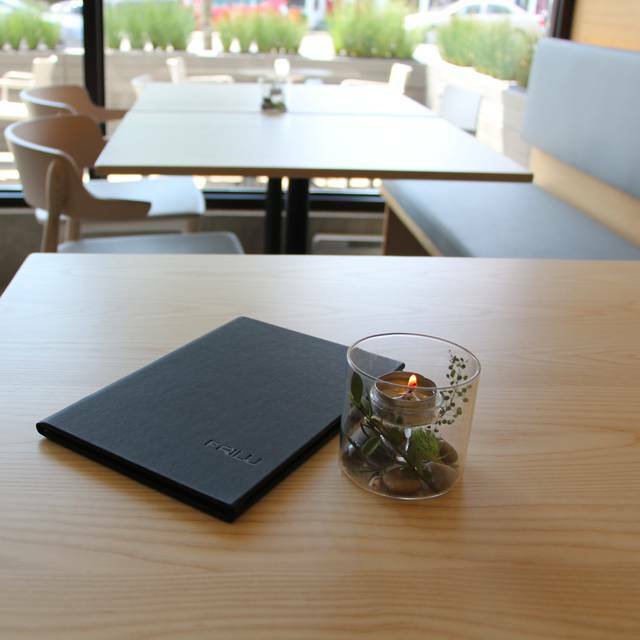 We think Frilu is a top 5 Toronto food experience but the best value!!! Such an amazing experience! It’s my third time around to try their seasonal menu that changes every few weeks and it never fails to impress me with the level of perfection and love you can see and taste crafted for every single dish. Absolutely amazing, friendly staff, perfect tasting dishes. Can’t wait for the next season!!! Small, intimate restaurant. Food was amazing. Presentation and service impeccable. Would definitely visit again. Finally decided to try Frilu out and it didn't disappoint! The interior was warm and stylishly-simple. I was greeted and led to the bar table, where I could chat with Kelli the general manager and learn more about the dishes and paired wines and sakes. As expected for any tasting menu, portion of each dish was not huge but all tasted great. I loved the Winter Turnip as the chicken puree was rich and hot (perfect for warming up in a winter evening). Another dish that surprised me was the black cod. The fish was done just right, moist inside, without too much seasoning which could have hidden the true taste of the fish. And the dessert of the night was a fried hazelnut tofu and sweet yam icecream, both sounded unusual but tasted really good. And I actually had an urge to call and tell my friend about this place while enjoying the meal! Exceptional food pairings great service and attention to detail. 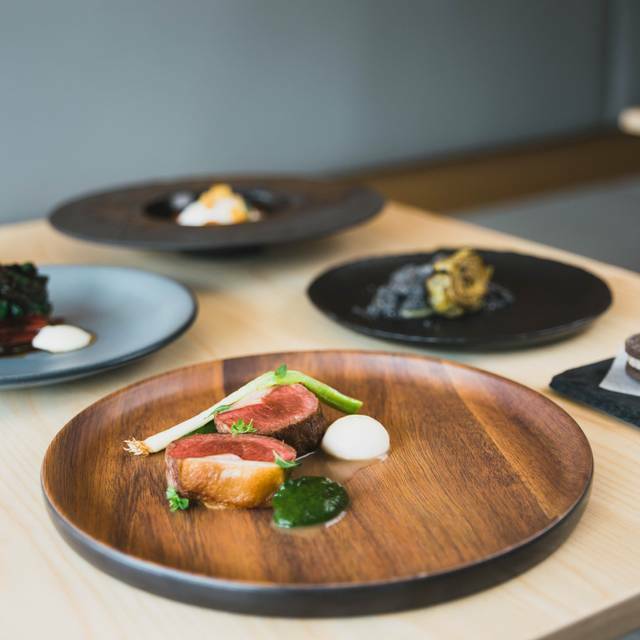 More than amazing food that has been meticulously prepared with extreme care and skill, Frilu is a destination that has the most charismatic owners and staff you could ever ask for in a restaurant. 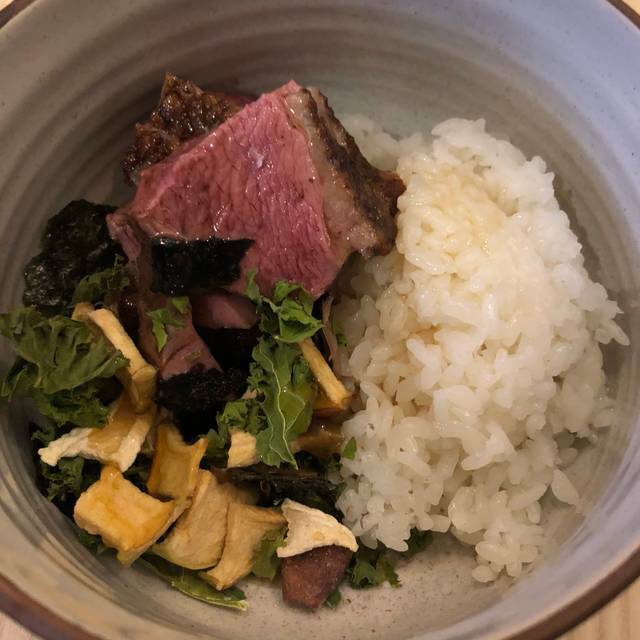 If you choose the alcohol pairing, you will notice the restaurant has a beautifully balanced "Yin and Yang" where the dishes prepared are wonderfully matched to various wines, ciders, and sake for the best enjoyment of your culinary journey. After 4 attendances, it's becoming clear that Frilu will stay as one of my absolute favourite restaurants, perhaps for a lifetime if I have any say into the continued success of such a great establishment. Great food and presentation. Lovely spot to bring a date or show off to a friend. Price is reasonable compared to similar establishments in Toronto. Our waiter was very forgetful of when we asked for lemon and water. It’s not a busy place and that’s the only order we placed as it’s a set menu. We didn’t need to ask several times until it was brought. The portions were extremely small. Each meal fit on about a teaspoon- I’ve been to restaurants like this before and the pre-set meals are very substantial you do not go home wanting to make yourself a snack but here the entire party was still hungry afterwards. We were not a fan of the dishes, they were mediocre. Edible but not outstanding. The waiter would bring each dish to our table and would whisper what they were. I understand it’s a quiet restaurant but it’s an issue when the diners cannot even hear what the waiter is saying. I would not recommend, save your money. First of all, we parked at the back of the restaurant as directed by Frilu’s website. The walk to the restaurant was a safety hazard with an unsalted, icy and slippery walkway. Secondly, Frilu took my credit card number upon reservation, so when I arrived on time and my table was still occupied. The server explained “The previous table arrived late, we tried to rush them but there’s nothing we can do.” I questioned, “So, why is that my problem?” Instead of addressing my question, the server simply walked away. Later the service manager came by and said “they’re still having dessert so you can wait at our bar table.” But the bar table didn’t have enough seats for the 6 of us. When I expressed again that I’m not happy about the arrangement, the service manager told me “well there’s nothing we can do to rush them, and I’m sure you have been late for reservations before”. I didn’t understand why I received a lecture on the unimportance of punctuality while I was on time and the restaurant was late! After 20 minutes, the 3 diners from the previous table agreed to sit at the bar to finish their dessert so the 6 of us can be seated. The service manager emphasized, “the guests are EXTREMELY NICE and offered to sit at the bar”. I happened to notice that they left around 40 minutes later. So if they weren’t extremely nice, was Frilu just going to make us wait for an hour? Couldn’t they be moved when our party arrived on time to avoid the whole unpleasant situation? In the middle of the meal we received a complementary dish for the wait, while I appreciated the gesture, it felt insincere and honestly a bit late after the horrible experience. Throughout the meal no one bothered to ask us about our experience, and as we were leaving no one said thank you or good bye (as they did with other guests). I did not appreciate Frilu’s unwillingness to own up to their problem and accept responsibility. Fantastic as always! Looking forward to my next visit! All was incredible. Delicious food, amazing presentation, fantastic service. 2nd visit, even better than the first. already booked our next visit. 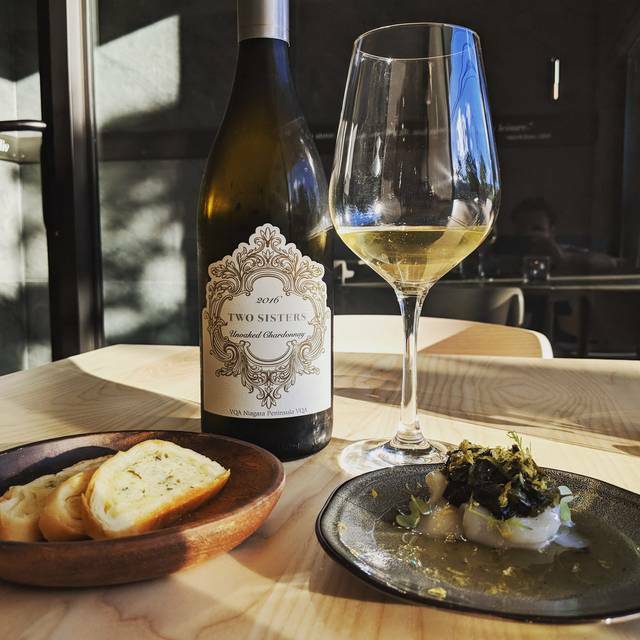 One of the best tasting menu's (and wine pairings) in the GTA. Highly recommended. Food was excellent, creative and well presented. Servers were a little inexperience (did not pour drinks, forgot to refill, asking for wine & drinks, ) for a fine dining restaurant, although it is evidenced that they were trying their best (very polite & friendly). Frilu serves teas but not espressos, hope that will change! We would definitely come back for the next seasonal menu! The food was great, service was exceptional. I visited here to celebrate my friend’s birthday and since it is 10years since we’ve been friends, I wanted to take her to a special place. I like the private atmosphere unlike other big franchised restaurants, and the food was handled with personal care. I was provided with special course meal since Im allergic to many ingredients that are commonly used in food, and the chef took extra care with this. Not all food in the course meal met my appetite, but I enjoyed it overall. Definitely recommend the place. It is hard to locate local restaurants in uptown. Please please go and enjoy the food and support the local restaurants! Interesting combination of tastes. Presentation above and beyond. Great tasting menu. Looking forward to next seasonal experience. Atmosphere, service, presentation are wonderful. Ingredients are fresh and fine, cooking methods are interesting and creative recipes. Taste is subjective depending on dishes. Celebrated a birthday with family. Service was attentive and the food was beautiful and delicious. Every dish was a work of art. The dessert was such a delightful surprise to all the senses! Loved the partridge on a pear tree - original and flavourful. Very lovely experience! Everything was gorgeously plated and it tasted just as amazing! We went as a family and we had a wonderful evening of food, drinks and conversation. The dishes were very dainty and creative with some fun themed dishes that were Christmas themed. Very impressive tasting menu. The ingredients are fresh and well coordinated. 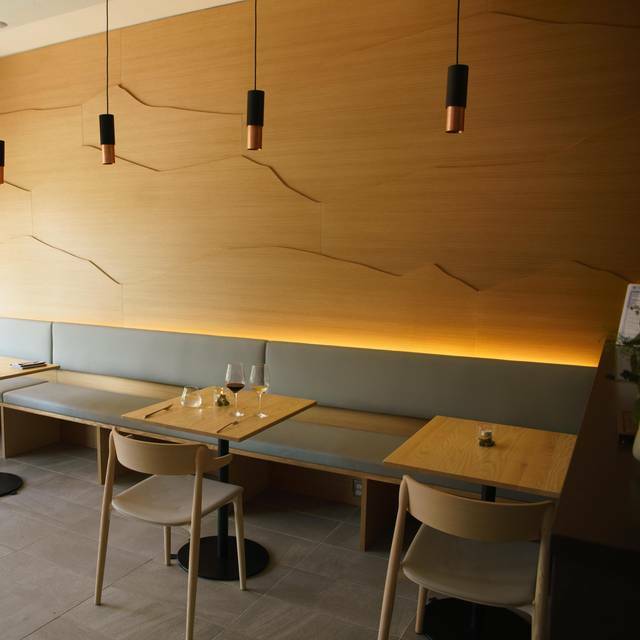 The dishes have strong Japanese influence, and match with the overall minimalistic and earthy decor. I would like to go back and look forward to their holiday/winter menu. Absolutely outstanding! Definitely come back for the food! Amazing experience , fall tasting menu with asian flavour. Cant wait to try winter suggestings. Second time at this restaurant. Great experience again! Definitely one of the best restaurants to open in the GTA this year. 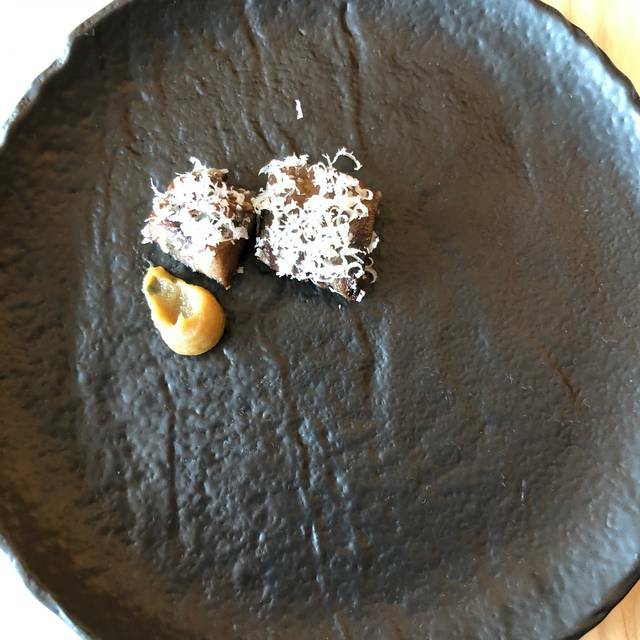 The tasting menu was fantastic and offered a lot of unique dishes. Very accommodating for food allergies. 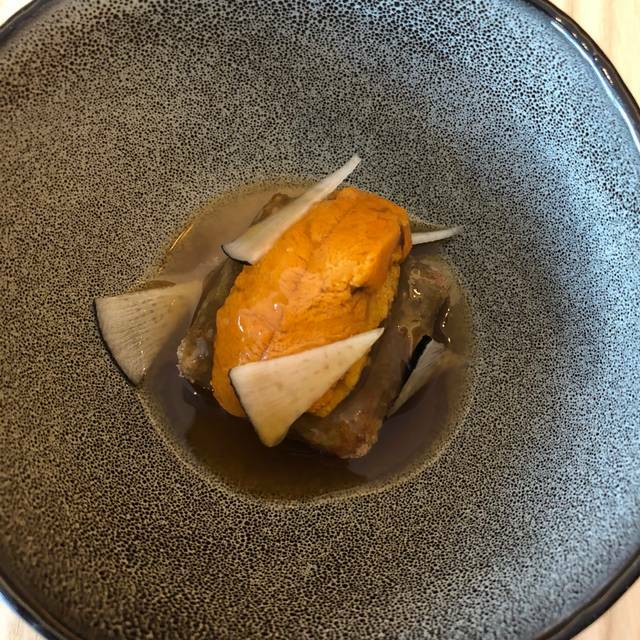 If I have to be nitpicky I would say that service lacked the refinement expected of a fine dining restaurant at certain points of the night, but in general was very attentive and friendly. Highly recommended. 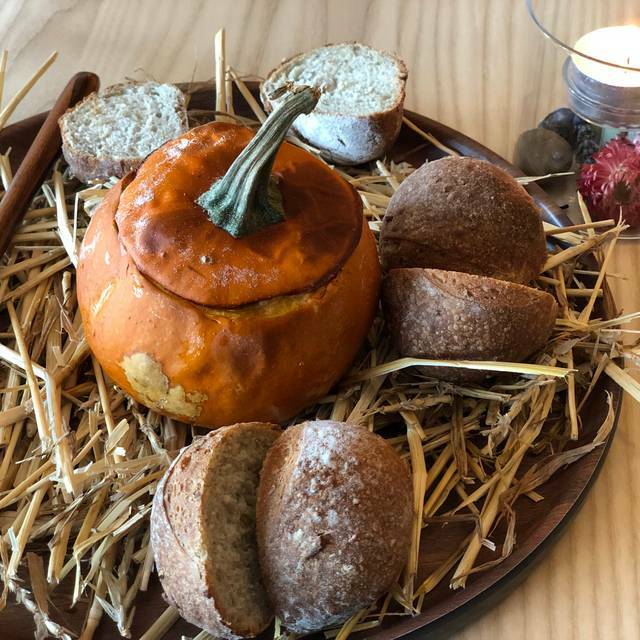 The 2018 fall rendition of the menu is dubbed “harvest moon, changing leaves” ($95) and consisted of ten dishes. After speaking to the couple beside us, they insisted the wine pairing is a must ($60). Indeed, they were right. The pairings were spot on going perfectly with each dish. Given my friend and I were driving, they even let us split a pairing, or the equivalent of about two glasses per person. Frilu aims to “excite and surprise” guests, so one dish that will span across all seasons in the Lar-Eo. Inspired by an Oreo, Frilu’s biscuit drops the chocolate and uses black quinoa and blueberry instead, which sandwich a creamy centre made with lardo(whipped pork fat) spiced with star anise. We’re advised t o eat the savoury cookie like an Oreo - twist it open and lick the centre – the creamy white filling silkier and lighter than the original offering. While the quinoa cookie is an interesting idea, it’s also a bit mealy and dry. If Frilu really wants to start with something whimsical, they should take the dish one step further and serve it with a warm cup of cream consommé. It would help balance out the dry cookie and give the diner the whole experience of dunking an Oreo in a cup of “milk”. Maybe they thought the cava paired with the Lar-Eo would be sufficient. It did help cut through the fat and added a refreshing contrast against the earthy spices, but didn’t revive a dry biscuit. This place is AMAZING!! If you want a VERY high quality, authentic, fine dining experience in uptown / GTA, you MUST check this place out!!! Every dish was plated to perfection, the detail in the service provided was on another level, super nice and respectful staff, great atmosphere in a minimalist design, dimly lit room... For the price for a 10 course menu it is extremely worth it ($95), additional $60 for a glass of wine paired with each dish! My favourite was Waterfowl: Marsh with duck, burnt onion, fall textures! I love their take on Asian Influence and creativity. Highly recommended. We had a great meal at Frilu, where they appreciate the purity and wholeness of the ingredients. Service was also personable and courteous.